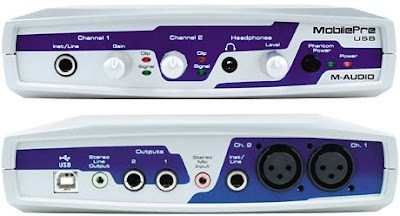 M-Audio brought out the MobilePre USB, a two-channel mic preamp with integrated converters which attach to your computer through USB. The street price tends to be extremely reasonable. Let's talk about the bad first. I hate USB as an audio interface. But, I will admit that I did find the USB interface and digital converters to be more stable and sound better than others I've encountered. But, even though the USB functions better than I expected I found myself let down by how the on-board mic pre handles mics requiring phantom power. Squalid seemed to come to mind as I tried several mics including the Blue Dragonfly and the Audio-Technica AT4040. It's as if it decided to turn my condenser mics into kazoos. I'd had enough. Finally, I plugged in an SM58. It sounded pretty good. I A/B'ed it with some top end preamps. It did surprisingly well. I've never heard a budget mic pre do this good with a dynamic mic before. Seriously, I was shocked that it sounded so good on an SM58. The MobilePre USB comes in an attractive blue and white case. On the front, you'll find the instrument/line input for channel one, the gain knobs for channels one and two, and a headphone plug with a volume knob. The phantom power switch is on the front as well. On the back, you'll find the USB plug, a stereo line (in/out), two 1/4 out plugs, a stereo mic input, the instrument/line input for channel two, as well as the XLR inputs for channels one and two. The power transferred through the USB attachment powers the MobilePre. I've had one report of this unit putting too much noise in the signal chain with other sources besides those running through condenser mics. I can see the credibility to this report due to the extreme crud the MobilePre put on a condenser. So, even though I had a good experience with dynamic mics only, you should test one out before purchase or buy from a dealer with a liberal return policy. The Bottom Line: I won't recommend this unit to someone who'll be using condenser mics. It takes a good condenser mic and makes it sound like it's in a frying pan. For condenser mic users, it's not recommended. However, if you are a hobbyist who is only going to use Shure SM57s, SM58s, or another dynamic mic then you might check the MobilePre USB out as the unit I tried out did a fine job with these mics. And, I did think the converters did a respectable job considering the price. But, due to issues reported by other users, make sure you try before you buy or be able to return the unit to get your money back.